Keep your silver dagger ready in the Gaming Hut as we look at campaign setting creation through the example of Ken’s Werewolves of Dacia, which will appear in the upcoming Best of Fenix anthology. Hat tip to Big Think for its Middle Earth-to-Earth conversion map. Next, Derek Upham Asks Ken and Robin to solve the mystery of medieval knights in dire combat with snails. Then, having found in the Cartography Hut a map showing where Soviet citizens were forbidden to go in 1955, we kick around the idea of restricted territories. Finally, in the Eliptony Hut, we look back at various conceptions of the alien before the standardization imposed by the classic UFO era. Additional hat tip: the no-index-cards-in-Italy story comes from Renato of Pinboard for the Mind. Once again Fenix Magazine occupies our coveted anchor sponsor slot. After ten years delighting the Swedish gaming scene, they’re poised to bring the Best of Fenix to English-language GMs and players with a February Indiegogo campaign. Seize the narrative steering wheel as a player in the Gaming Hut, where we discuss techniques to productively exercise character agency. Uncover the layers beneath the layers of the History Hut, in which we find gaming and story fodder in multispectral palimpsest recovery. In Ken and Robin Talk To Someone Else, we speak together to two someone elses, Cat Tobin and Simon Rogers of Pelgrane Press, who discuss the logistical lessons from the now-fulfilled Hillfolk Kickstarter. Then we rev up Ken’s Time Machine to, at the behest of new sponsor Sand and Steam Productions, save the Viking colony of Vinland from extinction. Yes, we said Sand and Steam Productions, now launching the Kickstarter for their Fate-powered mythic Norse RPG, War of Metal and Bone. 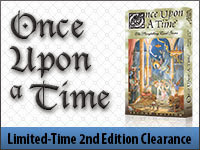 Also clambering aboard the sponsor train is Atlas Games, who in a dappled fairyland warehouse discovered the need to liquidate still perfectly fabulous copies of Once Upon Time 2nd Edition, as the 3rd Edition glimmers on the horizon. Take advantage of this special deal for Ken and Robin listeners! Episode 71: Oh, Tentacle Bob! We ring in 2014 with an Ask Ken and Robin from Ross Ireland, who wants to switch to a more serious horror tone after years of loosey-goosey play. Then we zoom back in time to the dying embers of 2013, for a segment of Ken and/or Robin Talk To Someone Else featuring James Wallis of The Extraordinary Adventures of Baron Munchausen and Once Upon a Time fame. We conclude our episode of all-eponymous segments with another dive into Ken’s Bookshelf, this time examining his haul from our recent trip to London. Once again we thank our anchor sponsor, Slabtown Games, who very soon will be launching a Kickstarter for Storyscape, a tablet-based tabletop roleplaying game Robin is currently designing for them.